Algorithms are instructions for solving a problem or completing a task. Recipes are algorithms, as are math equations. Computer code is algorithmic. The internet runs on algorithms and all online searching is accomplished through them. Email knows where to go thanks to algorithms. Smartphone apps are nothing but algorithms. Computer and video games are algorithmic storytelling. Online dating and book-recommendation and travel websites would not function without algorithms. GPS mapping systems get people from point A to point B via algorithms. Artificial intelligence (AI) is naught but algorithms. The material people see on social media is brought to them by algorithms. In fact, everything people see and do on the web is a product of algorithms. Every time someone sorts a column in a spreadsheet, algorithms are at play, and most financial transactions today are accomplished by algorithms. Algorithms help gadgets respond to voice commands, recognize faces, sort photos and build and drive cars. Hacking, cyberattacks and cryptographic code-breaking exploit algorithms. Self-learning and self-programming algorithms are now emerging, so it is possible that in the future algorithms will write many if not most algorithms. The British pound dropped 6.1% in value in seconds on Oct. 7, 2016, partly because of currency trades triggered by algorithms. Microsoft engineers created a Twitter bot named “Tay” this past spring in an attempt to chat with Millennials by responding to their prompts, but within hours it was spouting racist, sexist, Holocaust-denying tweets based on algorithms that had it “learning” how to respond to others based on what was tweeted at it. Facebook tried to create a feature to highlight Trending Topics from around the site in people’s feeds. First, it had a team of humans edit the feature, but controversy erupted when some accused the platform of being biased against conservatives. So, Facebook then turned the job over to algorithms only to find that they could not discern real news from fake news. Cathy O’Neil, author of Weapons of Math Destruction: How Big Data Increases Inequality and Threatens Democracy, pointed out that predictive analytics based on algorithms tend to punish the poor, using algorithmic hiring practices as an example. Well-intentioned algorithms can be sabotaged by bad actors. An internet slowdown swept the East Coast of the U.S. on Oct. 21, 2016, after hackers bombarded Dyn DNS, an internet traffic handler, with information that overloaded its circuits, ushering in a new era of internet attacks powered by internet-connected devices. This after internet security expert Bruce Schneier warned in September that “Someone Is Learning How to Take Down the Internet.” And the abuse of Facebook’s News Feed algorithm and general promulgation of fake news online became controversial as the 2016 U.S. presidential election proceeded. The White House released two reports in October 2016 detailing the advance of algorithms and artificial intelligence and plans to address issues tied to it, and it issued a December report outlining some of the potential effects of AI-driven automation on the U.S. job market and economy. On January 17, 2017, the Future of Life Institute published a list of 23 Principles for Beneficial Artificial Intelligence, created by a gathering of concerned researchers at a conference at Asimolar, in Pacific Grove, California. The more than 1,600 signatories included Steven Hawking, Elon Musk, Ray Kurzweil and hundreds of the world’s foremost AI researchers. The use of algorithms is spreading as massive amounts of data are being created, captured and analyzed by businesses and governments. Some are calling this the Age of Algorithms and predicting that the future of algorithms is tied to machine learning and deep learning that will get better and better at an ever-faster pace. While many of the 2016 U.S. presidential election post-mortems noted the revolutionary impact of web-based tools in influencing its outcome, XPrize Foundation CEO Peter Diamandis predicted that “five big tech trends will make this election look tame.” He said advances in quantum computing and the rapid evolution of AI and AI agents embedded in systems and devices in the Internet of Things will lead to hyper-stalking, influencing and shaping of voters, and hyper-personalized ads, and will create new ways to misrepresent reality and perpetuate falsehoods. Will the net overall effect of algorithms be positive for individuals and society or negative for individuals and society? Participants were asked to explain their answers, and most wrote detailed elaborations that provide insights about hopeful and concerning trends. Respondents were allowed to respond anonymously; these constitute a slight majority of the written elaborations. These findings do not represent all the points of view that are possible to a question like this, but they do reveal a wide range of valuable observations based on current trends. In the next section we offer a brief outline of seven key themes found among the written elaborations. Following that introductory section there is a much more in-depth look at respondents’ thoughts tied to each of the themes. All responses are lightly edited for style. 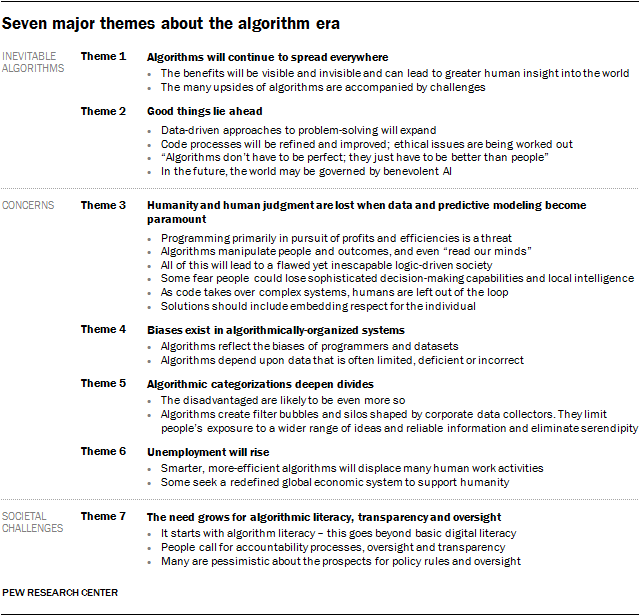 There is fairly uniform agreement among these respondents that algorithms are generally invisible to the public and there will be an exponential rise in their influence in the next decade. “‘If every algorithm suddenly stopped working, it would be the end of the world as we know it.’ (Pedro Domingo’s The Master Algorithm). Fact: We have already turned our world over to machine learning and algorithms. The question now is, how to better understand and manage what we have done? “Algorithms are a useful artifact to begin discussing the larger issue of the effects of technology-enabled assists in our lives. Namely, how can we see them at work? Consider and assess their assumptions? And most importantly for those who don’t create algorithms for a living – how do we educate ourselves about the way they work, where they are in operation, what assumptions and biases are inherent in them, and how to keep them transparent? Like fish in a tank, we can see them swimming around and keep an eye on them. Fact: We have already turned our world over to machine learning and algorithms. The question now is, how to better understand and manage what we have done? “Algorithms are the new arbiters of human decision-making in almost any area we can imagine, from watching a movie (Affectiva emotion recognition) to buying a house (Zillow.com) to self-driving cars (Google). Deloitte Global predicted more than 80 of the world’s 100 largest enterprise software companies will have cognitive technologies – mediated by algorithms – integrated into their products by the end of 2016. As Brian Christian and Tom Griffiths write in Algorithms to Live By, algorithms provide ‘a better standard against which to compare human cognition itself.’ They are also a goad to consider that same cognition: How are we thinking and what does it mean to think through algorithms to mediate our world? “The main positive result of this is better understanding of how to make rational decisions, and in this measure a better understanding of ourselves. After all, algorithms are generated by trial and error, by testing, by observing, and coming to certain mathematical formulae regarding choices that have been made again and again – and this can be used for difficult choices and problems, especially when intuitively we cannot readily see an answer or a way to resolve the problem. The 37% Rule, optimal stopping and other algorithmic conclusions are evidence-based guides that enable us to use wisdom and mathematically verified steps to make better decisions. “The secondary positive result is connectivity. In a technological recapitulation of what spiritual teachers have been saying for centuries, our things are demonstrating that everything is – or can be – connected to everything else. Algorithms with the persistence and ubiquity of insects will automate processes that used to require human manipulation and thinking. These can now manage basic processes of monitoring, measuring, counting or even seeing. Our car can tell us to slow down. Our televisions can suggest movies to watch. A grocery can suggest a healthy combination of meats and vegetables for dinner. Siri reminds you it’s your anniversary. “The overall impact of ubiquitous algorithms is presently incalculable because the presence of algorithms in everyday processes and transactions is now so great, and is mostly hidden from public view. All of our extended thinking systems (algorithms fuel the software and connectivity that create extended thinking systems) demand more thinking – not less – and a more global perspective than we have previously managed. The expanding collection and analysis of data and the resulting application of this information can cure diseases, decrease poverty, bring timely solutions to people and places where need is greatest, and dispel millennia of prejudice, ill-founded conclusions, inhumane practice and ignorance of all kinds. Our algorithms are now redefining what we think, how we think and what we know. We need to ask them to think about their thinking – to look out for pitfalls and inherent biases before those are baked in and harder to remove. Banks. Today banks provide loans based on very incomplete data. It is true that many people who today qualify for loans would not get them in the future. However, many people – and arguably many more people – will be able to obtain loans in the future, as banks turn away from using such factors as race, socio-economic background, postal code and the like to assess fit. Moreover, with more data (and with a more interactive relationship between bank and client) banks can reduce their risk, thus providing more loans, while at the same time providing a range of services individually directed to actually help a person’s financial state. “Health care providers. Health care is a significant and growing expense not because people are becoming less healthy (in fact, society-wide, the opposite is true) but because of the significant overhead required to support increasingly complex systems, including prescriptions, insurance, facilities and more. New technologies will enable health providers to shift a significant percentage of that load to the individual, who will (with the aid of personal support systems) manage their health better, coordinate and manage their own care, and create less of a burden on the system. As the overall cost of health care declines, it becomes increasingly feasible to provide single-payer health insurance for the entire population, which has known beneficial health outcomes and efficiencies. The efficiencies of algorithms will lead to more creativity and self-expression. 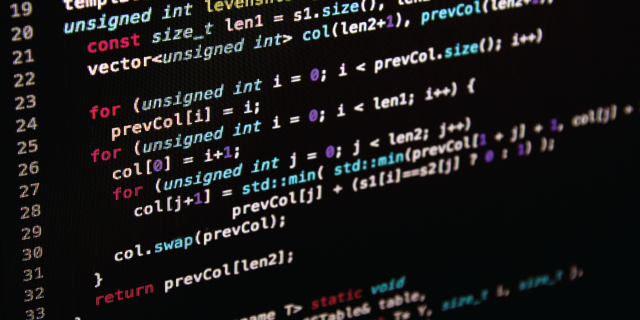 Participants in this study were in substantial agreement that the abundant positives of accelerating code-dependency will continue to drive the spread of algorithms; however, as with all great technological revolutions, this trend has a dark side. Most respondents pointed out concerns, chief among them the final five overarching themes of this report; all have subthemes. Algorithms have the capability to shape individuals’ decisions without them even knowing it, giving those who have control of the algorithms an unfair position of power. One of the greatest challenges of the next era will be balancing protection of intellectual property in algorithms with protecting the subjects of those algorithms from unfair discrimination and social engineering. The overall effect will be positive for some individuals. It will be negative for the poor and the uneducated. As a result, the digital divide and wealth disparity will grow. It will be a net negative for society. A number of participants in this canvassing expressed concerns over the change in the public’s information diets, the “atomization of media,” an over-emphasis of the extreme, ugly, weird news, and the favoring of “truthiness” over more-factual material that may be vital to understanding how to be a responsible citizen of the world. The spread of artificial intelligence (AI) has the potential to create major unemployment and all the fallout from that. I foresee algorithms replacing almost all workers with no real options for the replaced humans. We need some kind of rainbow coalition to come up with rules to avoid allowing inbuilt bias and groupthink to effect the outcomes. Baratunde Thurston, Director’s Fellow at MIT Media Lab, Fast Company columnist, and former digital director of The Onion, wrote: “Main positive changes: 1) The excuse of not knowing things will be reduced greatly as information becomes even more connected and complete. 2) Mistakes that result from errors in human judgment, ‘knowledge,’ or reaction time will be greatly reduced. Let’s call this the ‘robots drive better than people’ principle. Today’s drivers will whine, but in 50 years no one will want to drive when they can use that transportation time to experience a reality-indistinguishable immersive virtual environment filled with a bunch of Beyoncé bots. “3) Corruption that exists today as a result of human deception will decline significantly—bribes, graft, nepotism. If the algorithms are built well and robustly, the opportunity to insert this inefficiency (e.g., hiring some idiot because he’s your cousin) should go down. 4) In general, we should achieve a much more efficient distribution of resources, including expensive (in dollars or environmental cost) resources like fossil fuels. Basically, algorithmic insight will start to affect the design of our homes, cities, transportation networks, manufacturing levels, waste management processing, and more. There’s a lot of redundancy in a world where every American has a car she never uses. We should become far more energy efficient once we reduce the redundancy of human-drafted processes. “But there will be negative changes: 1) There will be an increased speed of interactions and volume of information processed—everything will get faster. None of the efficiency gains brought about by technology has ever lead to more leisure or rest or happiness. We will simply shop more, work more, decide more things because our capacity to do all those will have increased. It’s like adding lanes to the highway as a traffic management solution. When you do that, you just encourage more people to drive. The real trick is to not add more car lanes but build a world in which fewer people need or want to drive. “2) There will be algorithmic and data-centric oppression. Given that these systems will be designed by demonstrably imperfect and biased human beings, we are likely to create new and far less visible forms of discrimination and oppression. The makers of these algorithms and the collectors of the data used to test and prime them have nowhere near a comprehensive understanding of culture, values, and diversity. They will forget to test their image recognition on dark skin or their medical diagnostic tools on Asian women or their transport models during major sporting events under heavy fog. We will assume the machines are smarter, but we will realize they are just as dumb as we are but better at hiding it.